New York: The Viking Press, 1947. First edition of this work by the Nobel Prize-winning writer. Octavo, original cloth. Near fine in a very good dust jacket. Jacket design by Robert Hallock. A bright example. In his first novel to follow the publication of his enormous success, The Grapes of Wrath, Steinbeck’s vision comes wonderfully to life in this imaginative and unsentimental chronicle of a bus traveling California’s back roads, transporting the lost and the lonely, the good and the greedy, the stupid and the scheming, the beautiful and the vicious away from their shattered dreams and, possibly, toward the promise of the future. It was the basis for the 1957 film starring Jayne Mansfield, Joan Collins, Dan Dailey and Rick Jason. New York: The Viking Press, 1966. 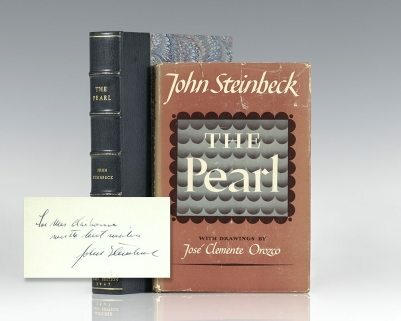 First edition of Steinbeck’s final book. Quarto, original half cloth, illustrated, cartographic endpapers. With 136 pages of photographs, 24 in full color by 55 of the most prominent American photographers of the era including Ansel Adams, Sam Siegel, and Todd Webb. Association copy, inscribed by the author on the half-title page, “For John Updike with admiration John Steinbeck.” American author John Steinbeck published his most notable works between 1937 (Of Mice and Men) and 1952 (East of Eden), and was awarded both the Pulitzer Prize for Fiction in 1940 and Nobel Prize in Literature in 1962. One of the most prolific American authors from the early 1960s until his death in 2009, fellow recipient of the Pulitzer Prize John Updike identified Steinbeck as one of his literary heroes at a young age. Both writers’ works explored themes of crises related to faith, injustice, and family dynamics applied to small town ‘everyman’ protagonists. Both Steinbeck and Updike wrote in a realist tradition featuring their own distinctively rich and imaginative vocabulary and style of prose. Near fine in a very good dust jacket. Housed in a custom half morocco clamshell box. Jacket design by Christopher Harris. Photograph of Steinbeck to the rear panel by Paul Farber. An exceptional association linking two of the greatest writers of twentieth century America. First edition of this classic story of simplicity, based on a Mexican folk tale. Octavo, original cloth. Presentation copy, inscribed by the author on the title page, “For Bob Kriendler with best wishes John Steinbeck.” The recipient was the owner of the legendary New York City landmark restaurant and speakeasy ”21”. Steinbeck was a frequent visitor to 21 and was friends with Kriendler. It has hosted every President since Franklin Delano Roosevelt except for George W. Bush has dined at 21 (although Bush’s wife and daughters have). 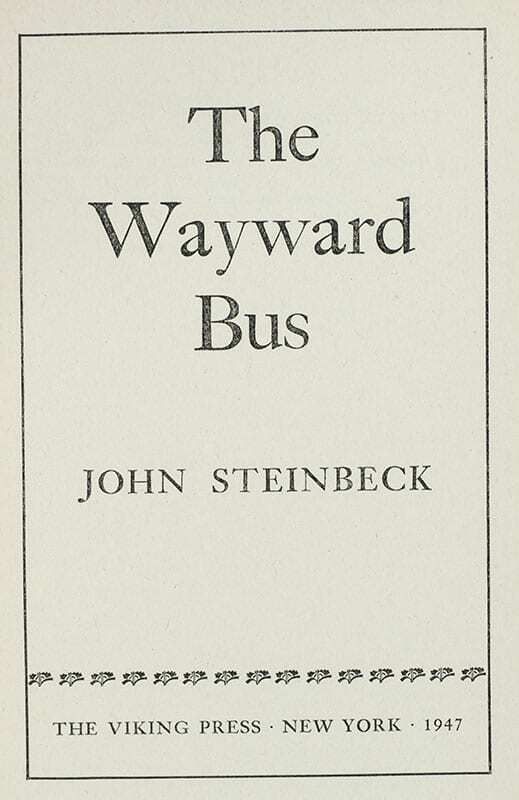 Light rubbing to the bottom cloth and small bookplate, near fine in a near fine first issue dust jacket with Steinbeck looking to the left on the rear panel. Drawings by Jose Clemente Orozco. Housed in a custom half morocco clamshell box. A nice association. New York: The Viking Press, 1939. First edition, with “First Published in April 1939” on copyright page and first edition notice on the front flap of the dust jacket. Octavo, original beige cloth. Near fine in a near fine dust jacket with some light wear to the extremities. Jacket design by Elmer Hader. First edition of this classic story of simplicity, based on a Mexican folk tale. Octavo, original cloth. 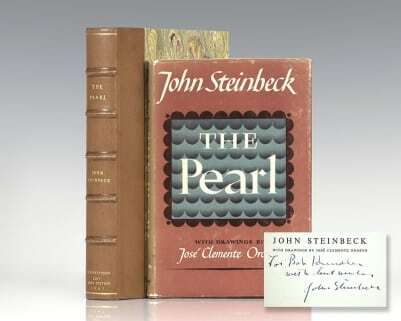 Inscribed by the author on the front free endpaper in a contemporary hand, “For Mrs. Clairborne with best wishes John Steinbeck.” Light rubbing, near fine in a very good first-issue dust jacket with Steinbeck looking to the left on the rear panel. Drawings by Jose Clemente Orozco. Housed in a custom half morocco clamshell box. 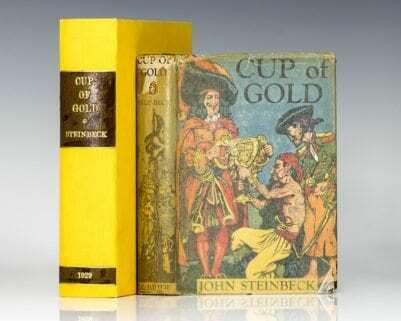 Cup of Gold: A Life of Sir Henry Morgan, Buccaneer, with Occasional Reference to History. New York: Covici Friede, 1936. First edition of the 1936 re-issue of the author’s first book. Octavo, original blue cloth. Fine in a fine dust jacket with the lightest of rubbing. A nice example. New York: The Viking Press, 1961. 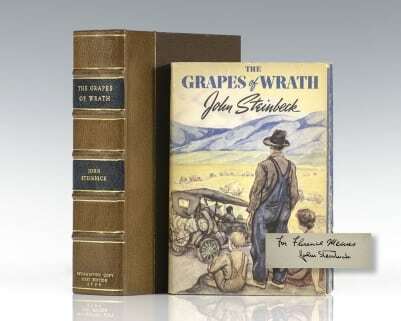 First edition of Steinbeck’s final novel, which along with The Grapes of Wrath are considered his masterpieces. Octavo, original cloth. Presentation copy, inscribed by the author on the front free endpaper in the year of publication, “For Betty Beecher, with all the best John Steinbeck Sag Harbor 1961.” The photograph of Steinbeck on the rear panel of the dust jacket is by William Ward Beecher (the husband of Betty) who has signed his name on the rear panel. Also laid in is a small clipping from the brown wrapping paper in which the book was shipped, in the author’s handwriting “From John Steinbeck Box 1017 Sag Harbor NY.” Some light dampstaining in a very good dust jacket. Jacket design by Elmer Hader. Lettering by Jeanyee Wong. Photograph by William Ward Beecher. Housed in a custom half morocco clamshell box. 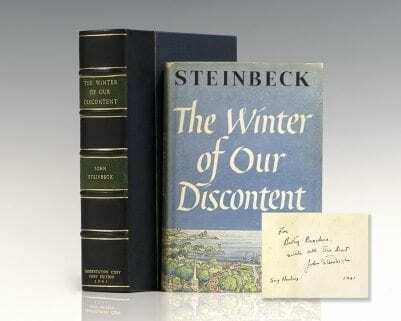 Presentations copies of Steinbeck’s masterpiece are rare. 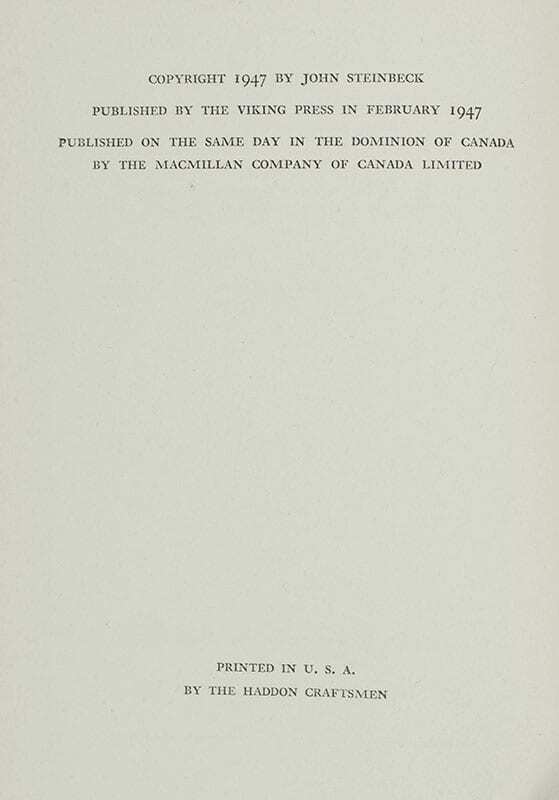 First edition, with “First Published in April 1939” on copyright page and first edition notice on the front flap of the dust jacket. Octavo, original beige cloth. 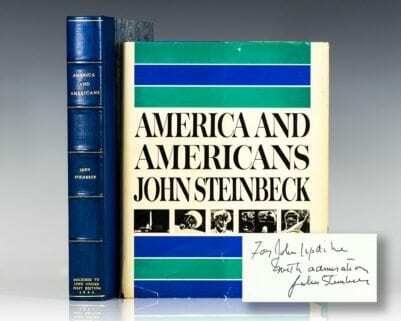 Presentation copy, inscribed by the author on the front free endpaper, “For Florence Means John Steinbeck.” The recipient was a secretary at The Viking Press, where this title was published. Fine in a near fine dust jacket with light rubbing to the extremities. Jacket design by Elmer Hader. Housed in a custom half morocco clamshell box. A nice example with noted provenance. New York: Robert M. McBride & Company, 1929. 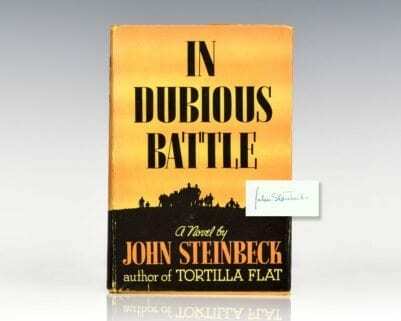 First edition of Steinbeck’s first book one of about 1500 copies. 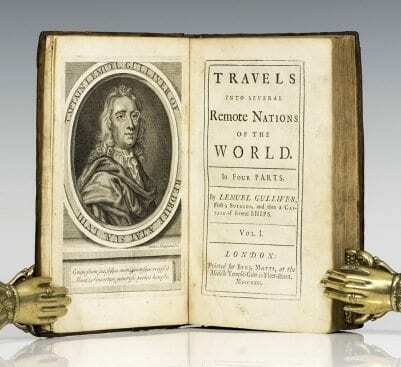 The publisher printed 2476 copies, 939 of which were remaindered as unbound sheets. Octavo, original cloth. Fine in a near fine dust jacket with light rubbing to the extremities. Comes with the original publisher’s glassine. Housed in a custom cloth case. Rare, especially in this condition. New York: The Viking Press, 1954. First edition of Steinbeck’s “rhapsody in blue about the rare and raffish characters who live on Cannery Row” (New York Times), basis for the Rodgers & Hammerstein musical Pipe Dream. Octavo, original cloth. Near fine in a near fine dust jacket with light shelfwear. Jacket design by Paul Galdone. New York: The Viking Press, 1945. First Illustrated edition of Steinbeck’s The Red Pony. Octavo, original cloth. Near fine in the original slipcase. Illustrations by Wesley Dennis. New York: Covici-Friede Publishers, 1936. 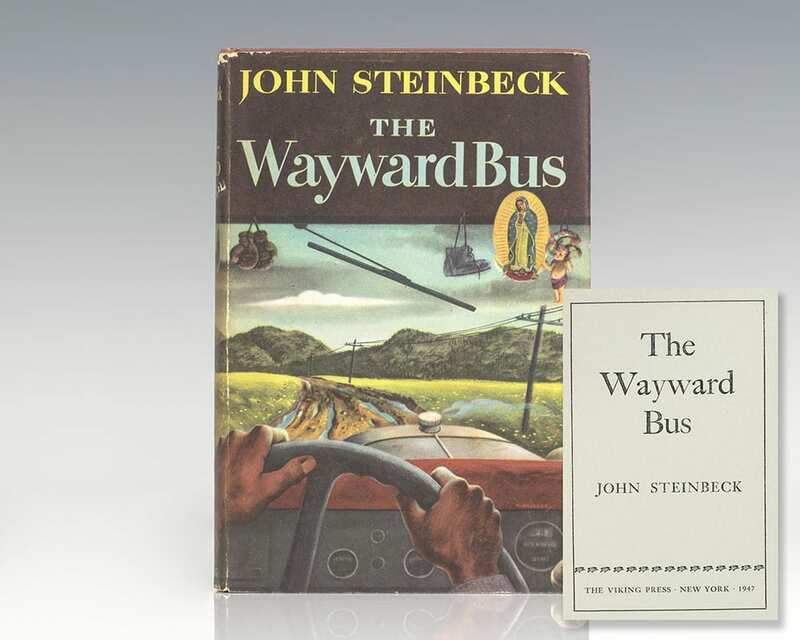 First edition of this “dramatically intense, beautifully written novel” (The New Republic); the first book in Steinbeck’s Dustbowl trilogy, which was followed by Of Mice and Men and The Grapes of Wrath. Octavo, original cloth. Signed by John Steinbeck on the front free endpaper in a contemporary hand. Near fine in a near fine dust jacket with light rubbing and a few short tears. Trade editions are rare signed.